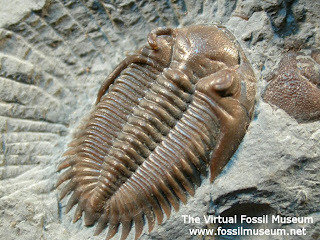 Okay, I’d better crack on with my round up of S193, Fossils and the History of Life’. 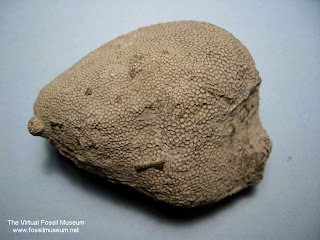 • 3 groups: 1) rugose (solitary or colonial) Ordovician to Permian; 2) tabulate (colonial) Ordovician to Permian; 3) scleractinian (solitary and colonial) Triassic to Recent. Note that Sea anemones and jellyfish are also cnidarians, but being soft bodied are rarely found in the fossil record. • Also known as ‘Moss animals’. • Consist of 2 parts or valves and shells made up of calcium carbonate mainly though some of calcium phosphate. • Are common fossil in Palaeozoic limestones and shales. 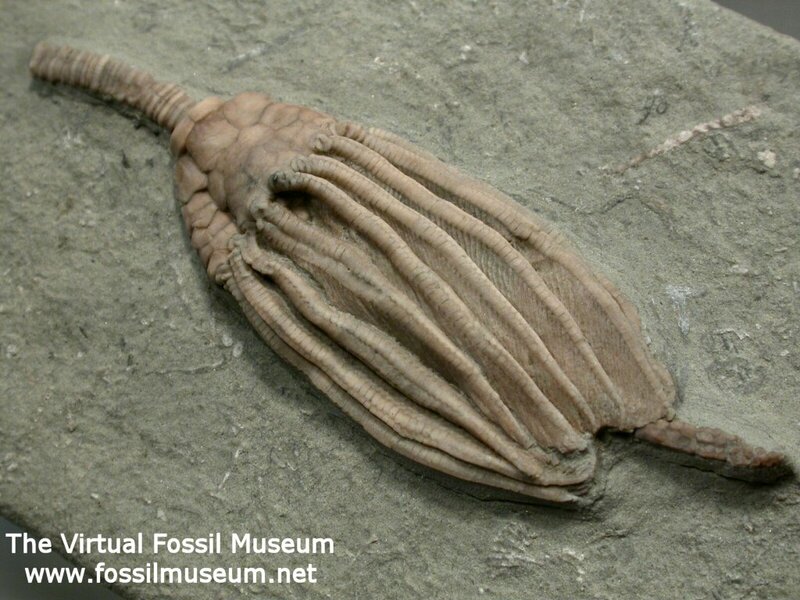 • Very diverse phylum and most abundant large invertebrates in the fossil record. Brachiopods seem rather similar to bivalves in many ways, but differ in that their ‘plane of symmetry’ passes through both valves rather than between them. Invariably, one valve is larger than the other in a brachiopod hence the common name of ‘lamp shells’. Gastropods are aquatic, living in shallow marine and freshwater environments. Cephalopods are entirely marine; have chambered shells and include ammonites, belemnites and nautiloids. • Entirely marine are benthic, sessile (fixed to rocks) or vagrant (move around sea floor). • Feed, respire and move using extendible tentacles called ‘tube feet’. • Echinoids commonly has 5 rayed arrangement of plates and tube feet.• The phylum includes sea urchins, starfish (asteroids) and brittle stars (ophiuroids) and sea lillies (crinoids, see below). • Found in land and water habitats. • Exoskeleton comprises chitin and possibly strengthened by calcium carbonate or phosphate. • The most important group of hemichordates are the extinct and entirely marine graptolites. These are confined to the palaeozoic era and are therefore an important zone fossil. (see later) These look strangely like ‘saw blades’ where the ‘teeth’ are actually small recesses that house individuals that make up a colony. • Include the 5 classes of vertebrates i.e. fish; amphibians; reptiles; mammals and birds. 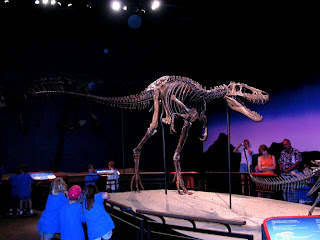 Above: Dinosaur fossil, a juvenile Tyrannosaurus rex, (Cretaceous) located at the Burpee Museum of Natural History, Rockford Illinois, USA. • Extinct groups include the land dwelling dinosaurs (see above); marine ichthyosaurs and plesiosaurs; and the flying pterosaurs. • Vertebrate fossils are rare and usually comprise only fragments. So that's a brief and way too rapid round up of the common phyla in the fossil record. The phylum 'Chordata' itself could warrant an entire blog on its own - as indeed any of them could. But I'll maybe do that at a later date if time permits. Next time I wil start that journey through time, starting with a look at the mysterious Ediacaran fossils, examples of which were found close to my hoome in the East Midlands, at Bradgate Park. Then I'll get down to the nitty-gritty of the 'Cambrian Explosion'. 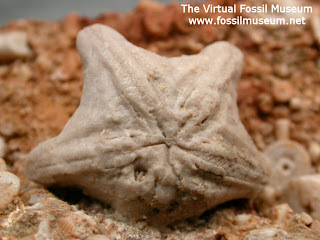 All photographs included above were courtesy of 'The Virtual Fossil Museum' web site. This is an excellent resource, providing photographic galleries of the fossil groups and a lot of other information besides. For a closer look click here. I interrupt the series of S193 summaries to bring you the long awaited result of the fossil course, just announced by the Open University . . . If I had got anything around 80% I would've been quite happy, but getting 97% just makes me wonder how I managed to lose those 3%!?! Anyway, detailed feedback will arrive by post soon I believe, so I'll let you know! Next up in a day or two will be Part 3 of my S193 summary.